It’s all about that talented forged composite wing, which looks like the flukes of a killer whale playfully breaching on a sunny afternoon. 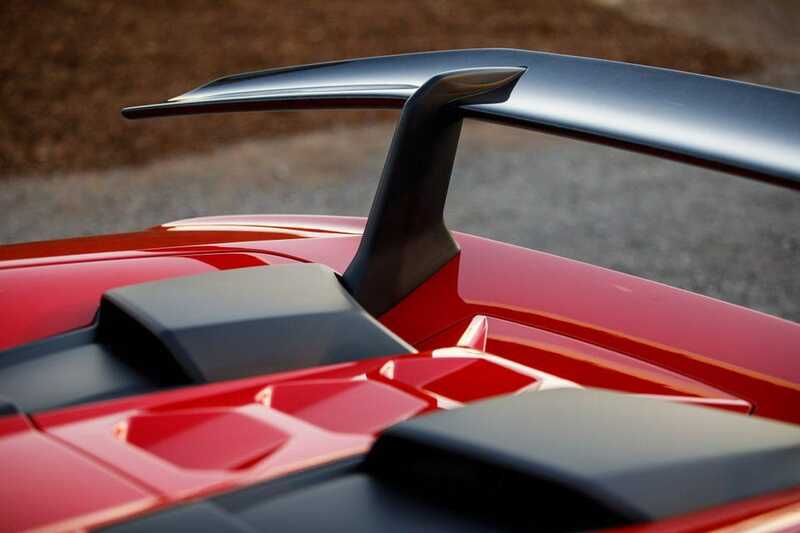 Huracán Performante Spyder’s rear wing is held high on two integral tubular arms that reach under the forged composite rear bodywork. 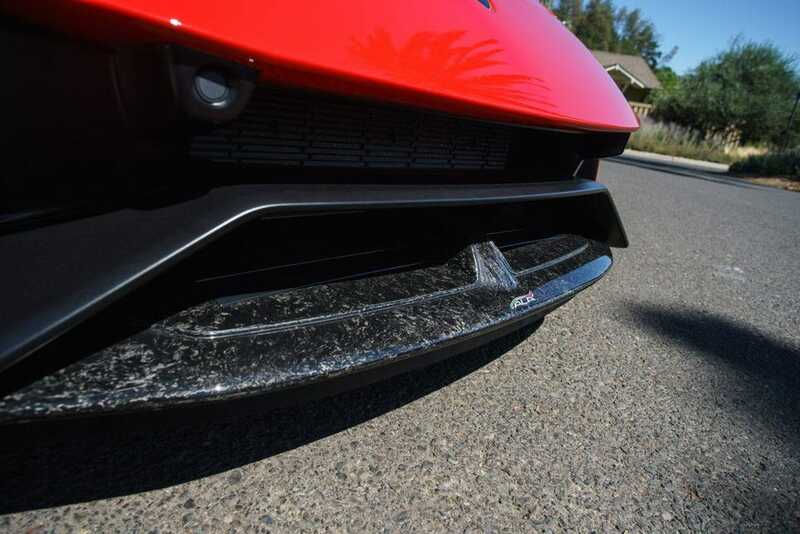 When the valves built into the arms open, air from the engine compartment shoots up the tubes and flows under and through each side of the hollow wing, allowing Performante to slip through the air more easily at high speed. When the data drawn from the collection of black box brains and gyros of the stability control system command the two valves to shut, blocking the flow of air, that broad wing generates downforce. 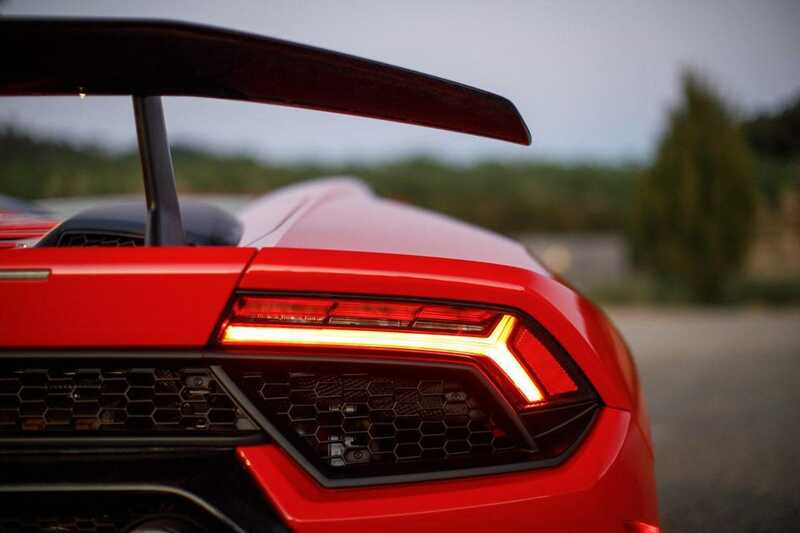 In basic function, the rear wing assembly of Aerodinamica Lamborghini Attiva (ALA) is like the Drag Reduction Systems (DRS) of a Formula One car. Though it does not change the Huracán top speed of 201 mph, Performante corners and accelerates with greater ability than other Huracáns. Those valves can open in unison or individually to deliver a clever little trick in cornering: downforce exerted on the left and right sides of the wing can be varied, adjusted. Glide through a series of medium-speed left-right-left corners, fast enough that the car comes to life, and ALA shifts back and forth, too, helping stick those fat Pirellis hard into the pavement. Active management of airflow with this elegantly simple system heightens the sensations of cornering, which is just as important as any measurable increase in performance. Pressure is felt shifting across chest, pulling through the gut, tugging at the neck. For pleasure seekers, this will be a new sensation not to be missed. It’s not how fast you go, but how you go fast. ALA up front is more basic, a classic under-chin S-shaped passage that opens to reduce drag at high speeds, and closes to exert downforce on the front structure during braking and cornering. There is no vectoring aspect up front. ALA brings a new dimension to what my old engineering pals consider a holy grail: predictable transitional handling, meaning a smooth roll rate with no abrupt motions when changing direction, back and forth. Well sorted magneto-rheological shocks, nicely weighted steering that harmonizes with suspension action, and that blessed wing out back deliver the goods. Anyone who revels in the efficient, fluid left-right-left movements of snow or water skiing, feeling energy through the hips, knees and torso, that joy of the body following where the head aims, will understand immediately. ALA elevates Huracán’s poise and capability, successfully updating a car that has been with us four years. And that wing is a conversation piece at the valet stand. Huracáns of all varieties are blessed with a musical instrument of increasing rarity: a naturally aspirated large-displacement purist sports car engine. Revs rise and fall nearly instantaneously in this 5.2-liter V10, with commensurate top tenor screaming and wailing when the engine is about its business. 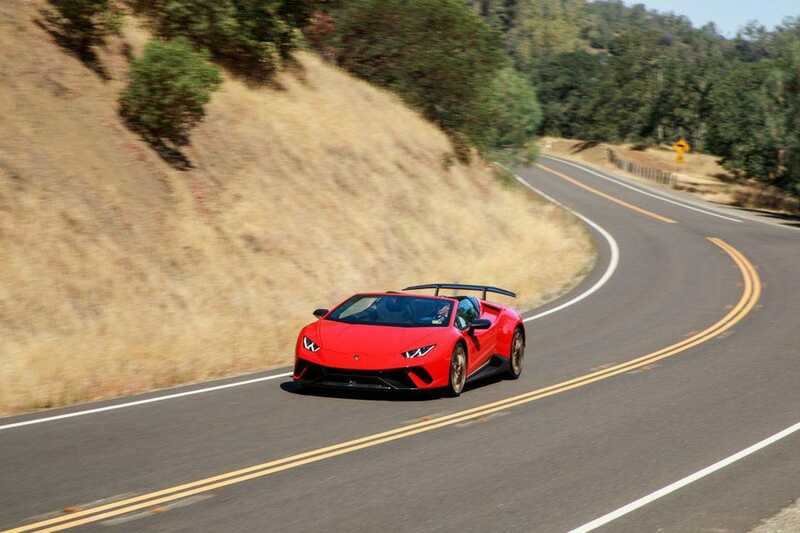 With an additional 30 horsepower, the Performante variant of the Huracán V10 spins out 640 at 8000 rpm, and will happily play above 4000 all day long, intoxicating music and motive power the reward. That 8000-rpm range is fully exploitable, completely enjoyable, the engine clearly willing and eager to rev beyond the 8000-rpm limiter. Running down a straight two-lane in wine country, it’s impossible not to paddle up, down and up again to compose a joyous, full-throated opera. 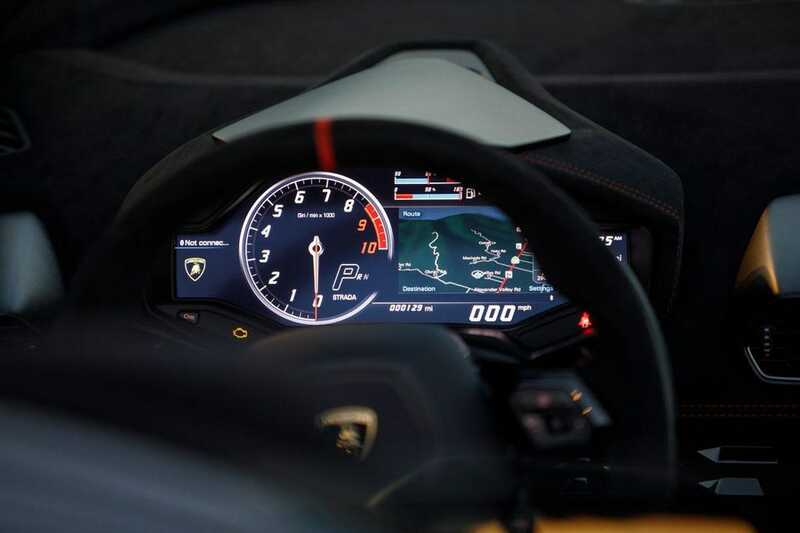 The added power and related calibration changes cut 0.3-second off the sprint to 60 mph, which at a breath over 3.0 seconds brings Performante Spyder to rough parity with its competitors in that most frequently exploited measure of performance. The power also cuts 0.9-second off the sprint to 124 mph (200 kph), which will make it very nearly a second quicker in that other favorite U.S. measurable, the quarter mile. If you must have that last tick more performance, Performante coupe is two-tenths quicker still to 60 and 124 mph, but then you’re giving up moonlight drives. I’ve witnessed people holding revs at 7000 rpm on long straights while traveling at well above any posted speed limit, just to hear those ten pistons sing, even if a couple of bumps up the extremely smooth and quick gearbox would be the more prudent approach—leave such prudence to the Germans. 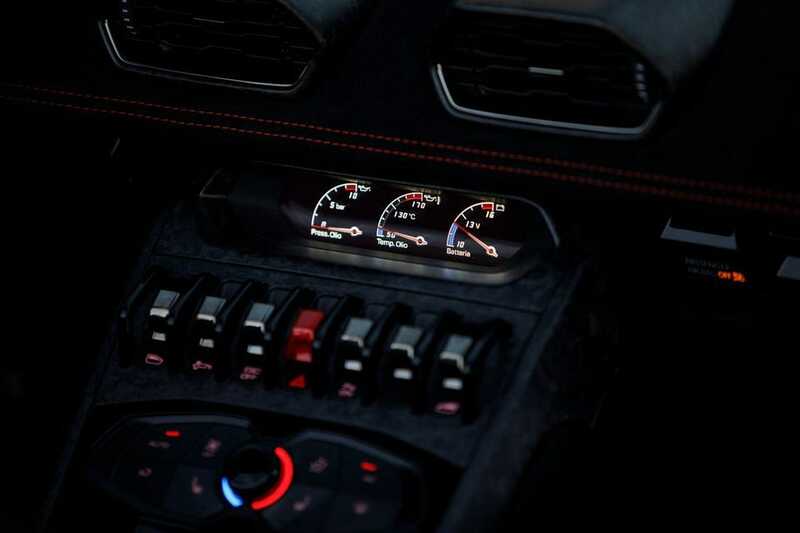 Performante not only possesses the power and the glory, but the engine has proven itself tough and durable, capable of very hard use on a regular basis. No need to baby it. Though the aero elements and sculpted surface trick the lens of the camera, giving impression in photos that Huracán is of goodly proportion, she’s a tidy little craft. CEO Stefano Domenicali, chief engineer Maurizio Reggiani and design boss Mitja Borkert have toured the U.S. to meet customers committed to a purchase and measure them to ensure a snug but comfortable fit. For tall guys, it’s like ordering a custom suit. Off the rack, Performante works for those under six feet tall. I’ve been in a Huracán with the seating adjusted to OAF settings and it’s millimeter tight, but it works. Performante’s interior is dressed in the same forged composite used to create the ALA components. 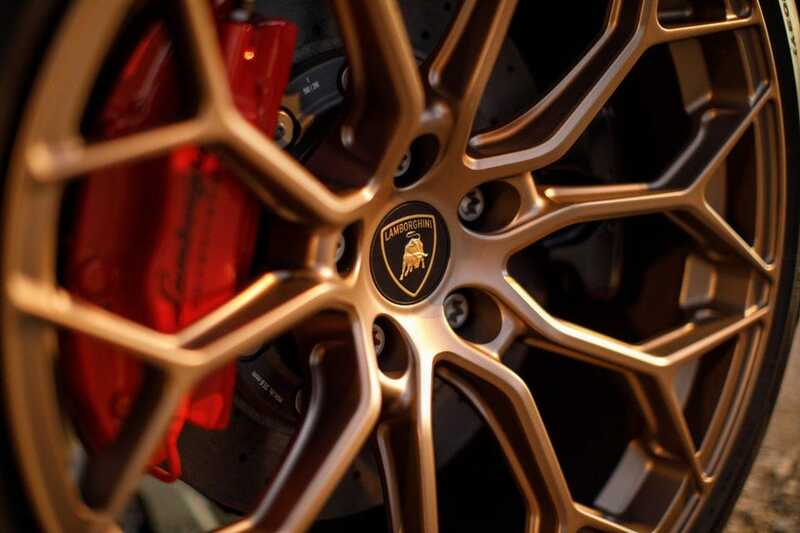 Just like any luxe or exotic car, Huracán benefits from accessing its parent’s depthless engineering. 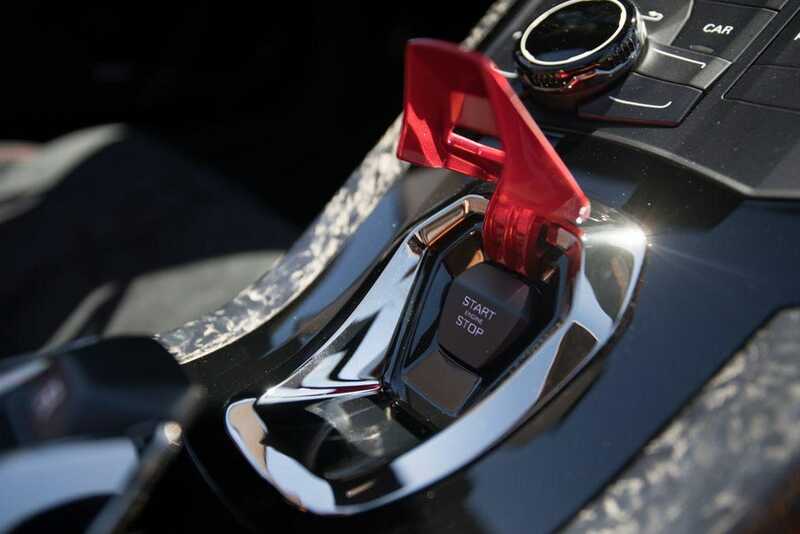 Lamborghini switchgear works beautifully, just like in an Audi, Bentley, or Bugatti. Spend 20 or 30 minutes crawling around the car and the precision fabrication of each piece is evident. 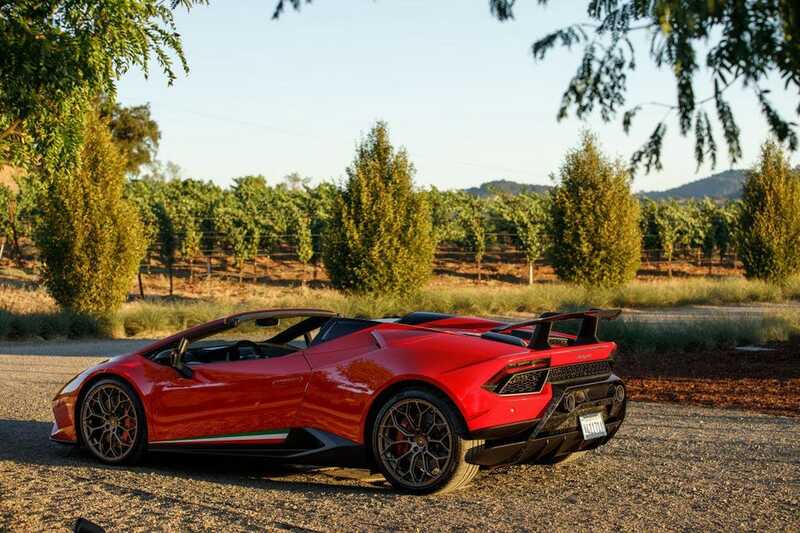 It may be exotic, but Performante Spyder is a tough little bull, and crafted with jeweler’s precision. Performante is a logical progression of the powertrain, calibration, and aerodynamics of Huracán, the best-selling Lamborghini ever, the car that has secured Lamborghini’s long-term health and well-being. 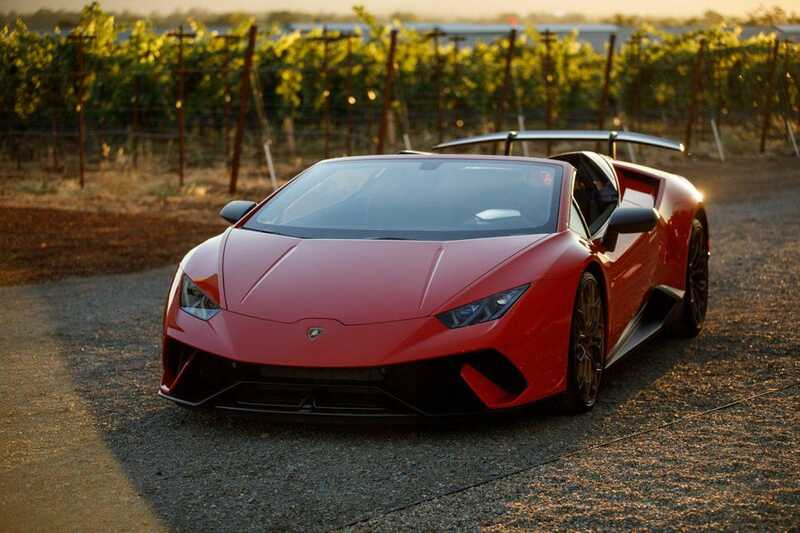 Lamborghini has sold just over 11,000 Huracán worldwide since introduction four years ago. That sales rate is balanced on a knife edge, ensuring Huracán and particularly Performante ownership is an exclusive club, yet it’s a large enough volume to shift and open the population of owners, changing and expanding the character of the brand.